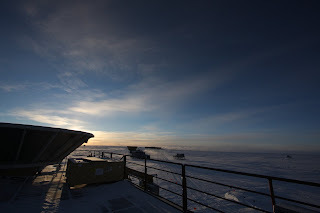 It's now late afternoon in the South Pole's yearly day. There is less than a week left now until sunset, and it shows. The sun just circles on the horizon, and shadows extend ridiculously far. 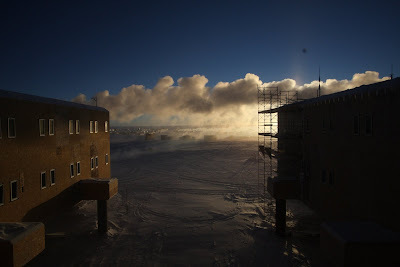 The temperatures have continued to drop, and the windchill broke -80C (-115F) the other day. It's cold enough now that the power plant gives off an impressive plume of steam, extending for (literally) miles downwind. For hours in the middle of each day, it blankets my entire world - station, flag line, and DSL - in shadow. The snow has begun to take on an orangey-pink tint from the setting sun, and the landscape is filling with color for the first time since I arrived. Someone commented yesterday that the fields of snow now look like an ocean, only frozen in time - I think that describes them nicely. This time of year, every day is more beautiful than the last here at pole.